Shaded rocky slopes. Also occurs on shaded dune slopes and clay slopes. Aralia nudicaulis, Celastrus scandens, Mitella diphylla, Solidago flexicaulis, Thalictrum dioicum, Tilia americana. 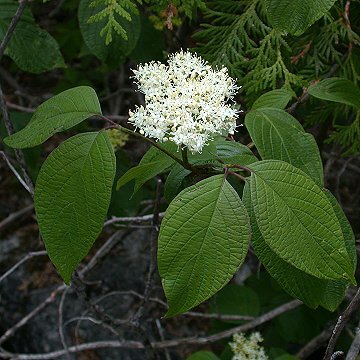 Quebec west to northern Ontario and Manitoba, south to NJ, PA, northern OH, northern IN, and IA, and in mountain to VA..
Shrub or small tree to 4 m; twigs glabrous or nearly so, yellow or yellow-green with dark purple spots; pith white. Leaves opposite, nearly orbicular, 7-12 cm, abruptly acuminate, broadly cuneate or rounded at the base, white hairy to merely strigose below; lateral veins 3-4 on a side, often arising from the lower half of the blade. Flowers in flat or slightly convex, open cymes. Fruits pale blue, 6 mm. Specialized habitat requirements limits the distribution of this species. The fall color is quite good, ranging from purple to red-orange.